A boy in a white kimono shows a sports kick. The athlete on a dark background throws one arm forward, and the second remains with the body. The hand almost covered the boy's face. 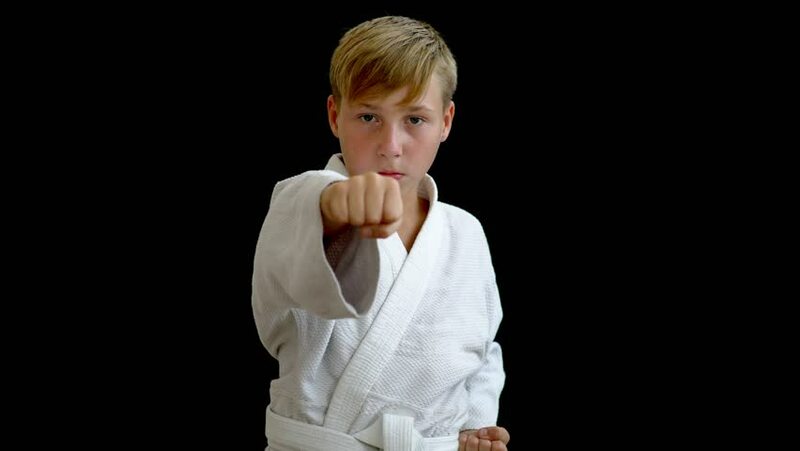 4k00:05A young athlete in a white kimono shows a punch with his right hand. The boy holds one arm around the waist, and the other moves forward. The boy has blond hair and dark eyes. 4k00:06A young athlete in a white kimono stands on a dark background. Hands of a young man go down, he has blonde hair and dark eyes, a European look. 4k00:07A young athlete in a white kimono stands on a dark background. The boy has blond hair and a European look. Hands fall, around the waist there is a white belt. hd00:15A small boy is wearing white uniform for judo. He is tightening his belt and he is taking a bow. He is having a judo practice. 4k00:09A young athlete stands in a boxing rack, makes a punch. His right hand is advanced, the left hand remains in place. The young boxer stands on a dark background and in a gray sports shirt. 4k00:13The boy is engaged in boxing. In the foreground there are hands in black and white gloves, the boy's face is blurry. A boxer in a gray sports shirt stands on a dark background. 4k00:08A young athlete stands on a dark background, he holds folded palms on his chest. This means a greeting. The face of the young man is not visible, at the waist there is a white belt. 4k00:10A teenage athlete stands on a dark background and holds his hands in gloves. The boy almost covers his face, his eyes are visible. He has a gray shirt without sleeves, he has blonde hair. 4k00:12A teenage boxer in a gray sleeveless shirt holds his hands in gloves near his face. The boy stands on a dark background, he has blonde hair and dark eyes. The boxer's hands are parallel to each other. 4k00:08A young man in black and white gloves in a gray sleeveless T-shirt stands on a dark background. He stands sideways, the glove partially covers his face. The boy has blond hair and dark eyes. 4k00:05A young sportsman is engaged in boxing. Hands fall on the body, the upper part of the body is visible. The boy is looking at the camera. He has blond hair and dark eyes, a gray shirt without sleeves.